Experience a different facet of wellbeing as Four Seasons Koh Samui propose ‘Reasons To…’ dedicate quality time to wellbeing. From deep nourishment and restful sleep, to luxurious pampering and active play, guests can indulge in a combination of Resort experiences, Spa therapies and dining through four unique programmes designed to suit individual wellness styles. A sequence of replenishing spa experiences await guests, including a rejuvenating body scrub, a healing wrap and a scalp massage with warm coconut oil, made from freshly plucked Samui coconuts. 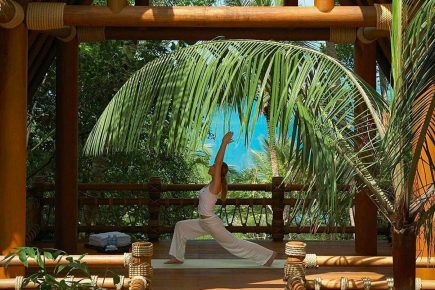 A private session of yoga and the art of juicing using fresh tropical ingredients is interspersed with six power-packed mini-meals through the day. The day of bliss begins with a session of flow yoga, uniting breath and movement. A Lava Shell Massage ensues, where perfectly warmed Pacific clam shells provide muscular relief. The preparation for a restful night continues with an hour of meditation, followed by a luxurious candlelit bath in the privacy of the villa, and a relaxing shoulder and neck, feet or head massage. Breakfast in bed the next morning completes this experience of soul-deep relaxation. This traditional pampering allows guests to relax and recharge through a series of luxurious experiences, starting with breakfast in bed. The indulgence continues at The Secret Garden Spa with a 3-hour-long Earth to Sky Ritual. This fragrant and cocooning top-to-toe treat includes a nourishing scrub, a massage combining pressure point and gentle stretching techniques, and steam compress filled with local Thai medicinal herb. Guests can savour herbal infusions and refreshing high tea in the breezy open-air terrace of the Spa. Featuring activities that inspire and refresh, this experience allows guests to rediscover their sense of possibility and adventure. The morning begins with guided exercises at the gym or on the beach, while the afternoon is dedicated to learning Muay Thai, the ancient Thai art of kickboxing. Guests can enjoy a healthy lunch between activities, and cap off the day with a blissful Magnesium massage, known to release muscular tension and enhance sleep.